I have a couple of foodies memberships. Palate featured a different set of restaurants, and we decided to go to Da Paolo Bistro Bar for our usual after-church Sunday Brunch. Firstly, some idiotic driver parked his SUV across 2 lots, leaving the only empty lot (*obviously*) un-parkable. The, the waiter got our reservation screwed up – instead of 6 pax, they only arranged for 4. Instead of trying to solve our problem, they just left us waiting. We decided to take matters in our own hands and moved our asses to the only table available then. Luckily the food was not too bad. After the fiery start (in terms of p, we were treated to some pretty good started – a bruschette, a salad and a pasta. 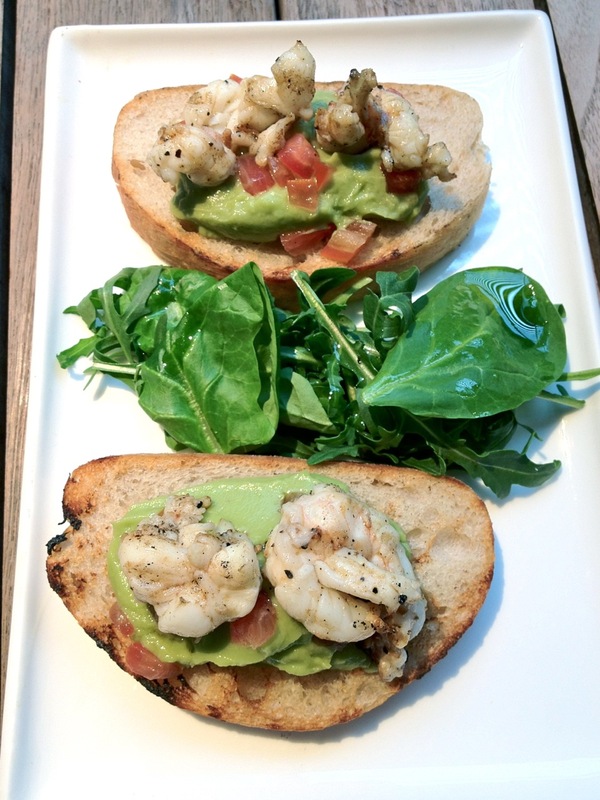 2 pieces of well-seasoned and grilled shrimp resting perfectly on a bed of avocado mash with sprinkles of tomato on a toasted baguette – I would have given it a perfect score only if there are more of those char-flavoured shrimps. The salad was OK (nothing to shout about), but the Squid Ink Pasta was one of the better ones in Singapore. 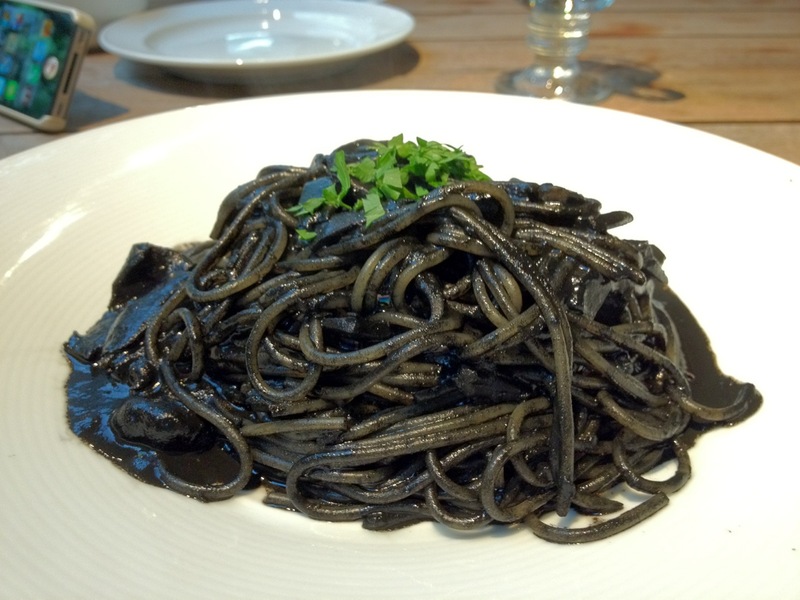 It was close to the original Spaghetti Nero I was introduced to in Italy – squid and squid ink, nothing else. A simple yet indescribable delight in many ways, this remained one of my favourite Italian dish of all times. And the team in Da Paolo had made a valiant attempt at recreating this memory of mine. We ordered 2 mains, a risotto, a pasta and a pizza. The pizza is the usual Roman pizza (rockets, cured ham) but with Iberico ham and Chorizo, giving it a Spanish twist to an Italian classic. The Crabmeat pasta was nothing to shout about. 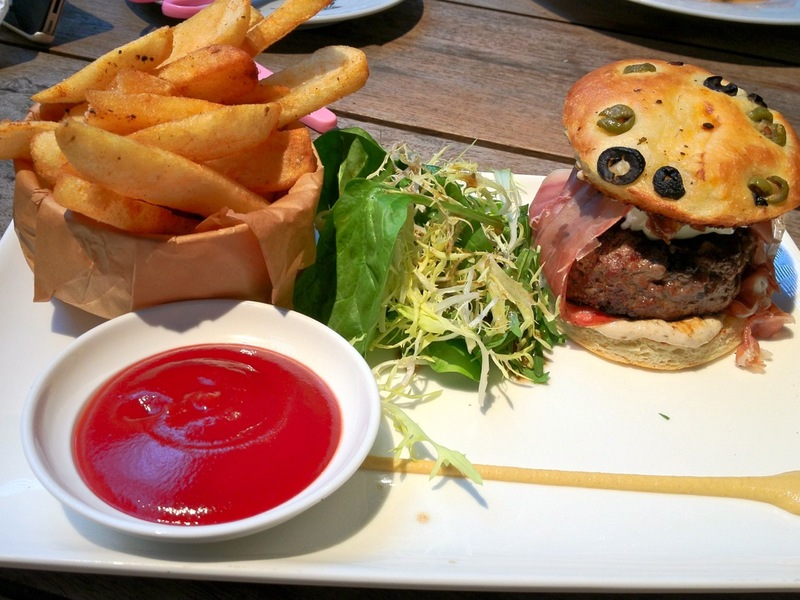 The Wagyu Beed Burger was a delightful quarter-pound patty on caramelised onions and bacon, pronged on liberal amount of swiss cheese on a toasted black olive bun, served with thick-cuts fries. Yummy. I could not eat it with my hands – too messy, everything keeps oozing out. But it was as good using the cutlery. 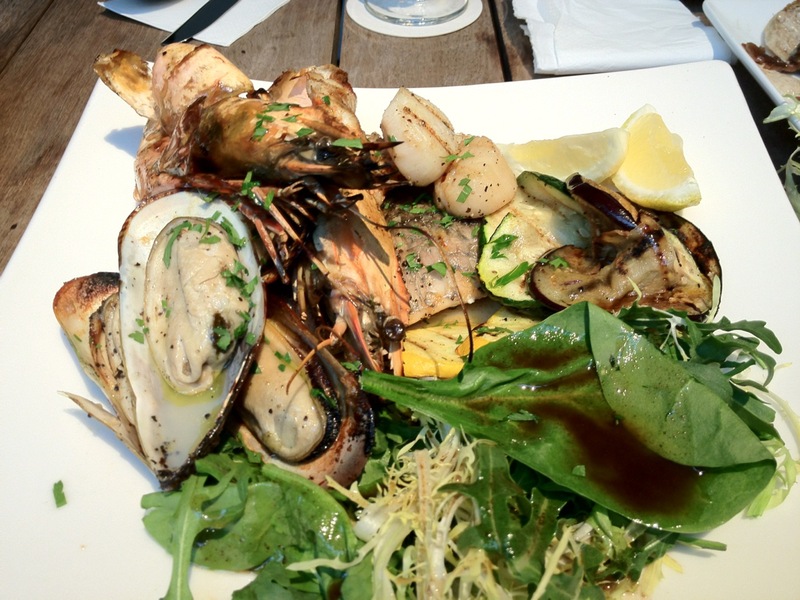 The Grilled Seafood Board was generous serving of 2 king prawns on a piece of seabass, with mussels, scallops and grilled zucchinis on a bed of salad. The seafood were well-grilled and the portion was good for sharing. But the piece de la resistance was the mushroom risotto. Strangely, the taste reminded my Marmalade porridge that I had a kid, but in a good way. Mind you this is veg dish, so I suspect Vegmite would be more appropriate. 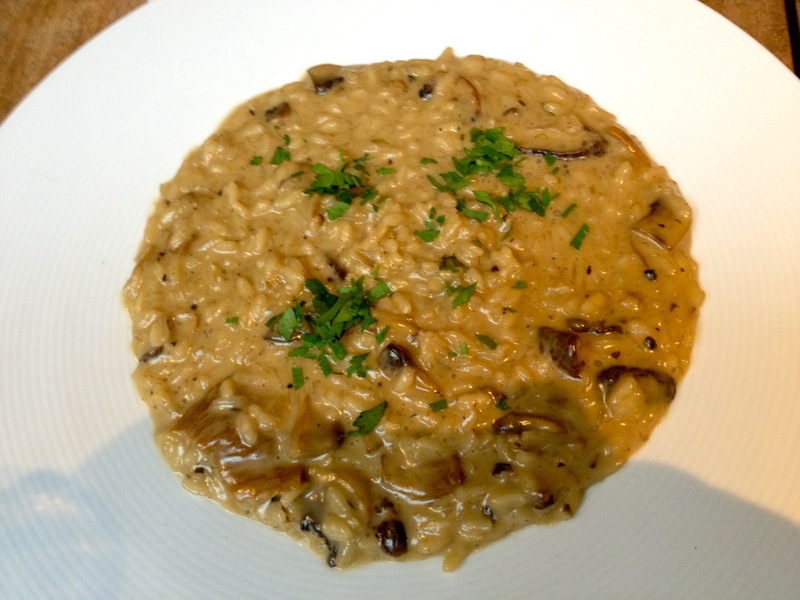 Every mouthful was a spoonful of creamy mushroom and well-flavoured risotto. Just enough sauce, and not over-powering, this was our favourite of the afternoon. I could not give it a perfect score just because I secretly hope there would be a better risotto than this. This one has set the yardstick which I will compare others with, yes it’s that good. After a trio of forgettable desserts, the bill came up to around $45 per pax (after the 20% discount with my Palate card). Ambiance – good, it is in a B&W bungalow and the kitchen was set in the servant’s quarters. Food – excellent, would go for it again. Service – apart from the manager (the saving grace for the afternoon), I reserve my comments on the service staff. All I can say it that I longed for the yesterdays when service staff was more local.